Long time, no write! Just a quick update to let you know that our second print annual is in the proofing stages. A PDF of the issue was sent to contributors today, with plans to complete proofing by the end of the month. Once again the issue is in full color and should be available for purchase sometime in June, with a release party planned for Cave Junction, sometime in late June, July, or August. Cover price is $8 but contributors receive a free copy. Speaking of contributors, this issue features great cover art by Kelpie Wilson, as well as words and art by the following line-up: Zvi Habaranoff, Amy Peterson, Desmond Serratore, Iris Chinook, Pamela Haunschild, Kaci Elder, Susan Gustafson, Veronika Trishyna, Katie Chamberlain, David Newell, Paul Forristal, Waves Forest, and Sydney Clinton. More info as we get closer to the release date. Thanks! 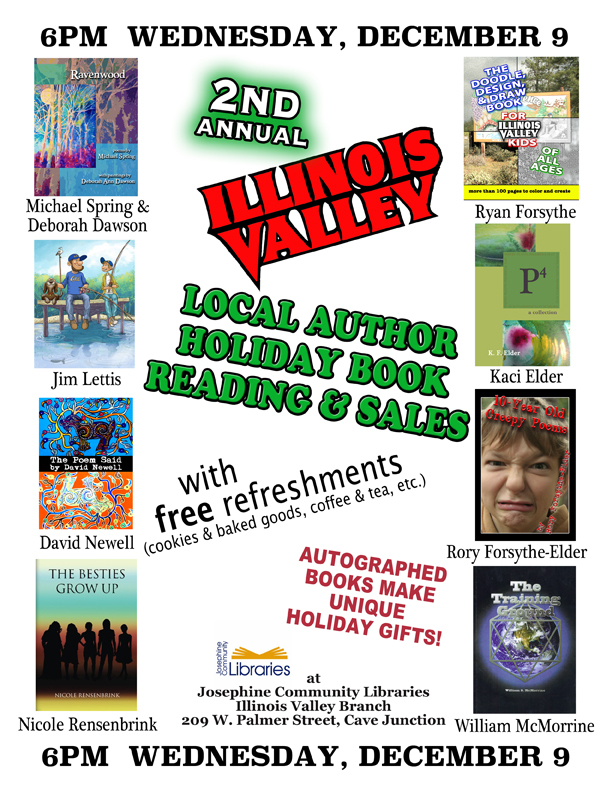 Coming soon, on Wednesday, December 9, is the second annual Illinois Valley Local Author Holiday Book Reading & Signing event. Cobra Lily editors Ryan Forsythe and Michael Spring will be sharing their latest works, as will several other local authors. The authors themselves will provide free baked goods and the library will provide coffee and tea. There’s a Facebook page for the event–please invite your friends! Yes, it’s finally here: the third issue of our online quarterly (and print annual!) Cobra Lily: a review of southwest Oregon literature & art. Below is our Table of Contents for Issue 3, though you can also find it here. Next up in this issue of Cobra Lily is, well, “Cobra Lily,” editor Michael Spring‘s poem about the carnivorous pitcher plant from which our review takes its name (yup, from the plant andfrom the poem). Next Wednesday, December 3, you’ll have the opportunity to hear the words of a few of our contributors, as well as our two co-editors. At the 1st annual Illinois Valley Local Authors Holiday Book Reading, Kindi Fahrnkopf (issue 1) will be on hand to read and/or discuss her book Takilma Tales: The Hippie History of Takilma, Oregon. Also, Buckwheat Bob Harrison (issue 1) will be represented when his friend Mara reads from his book, Hippie Tales of the Northwest Woods. She’ll also have autographed copies for sale. Co-editor Michael Spring will share his poetry, while the other co-editor Ryan Forsythe will present his latest book, Goldilocks and the Three BARs (Beyond Available Resources), which is a collaboration with his son Rory. 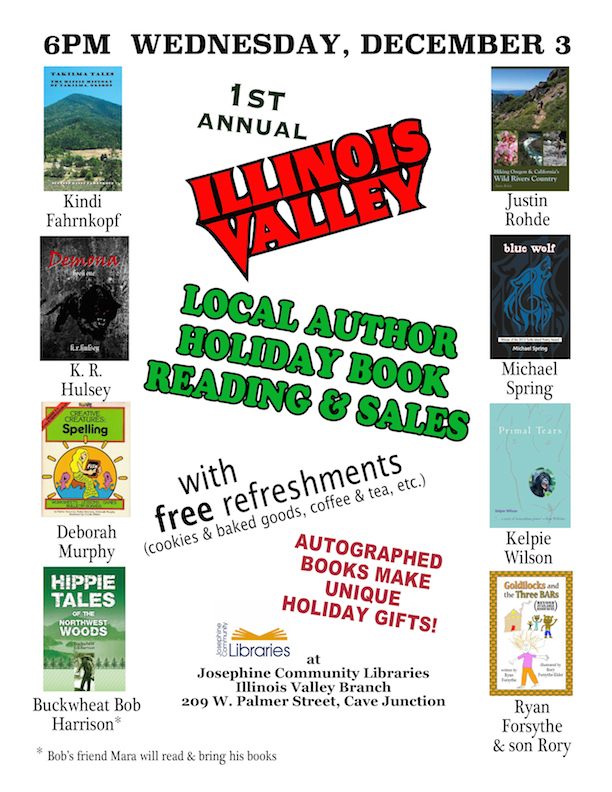 You can also meet and hear from other Illinois Valley authors (who hopefully will appear in a future Cobra Lily! ): K. R. Hulsey, author of the fantasy novel Demona; Deb Murphy, co-creator of the Creative Creatures series of educational activity books; Justin Rohde, author of the hiking guide Hiking Oregon and California’s Wild River Country; and Kelpie Wilson, author of the novel Primal Tears. Yes, we’re a few weeks behind schedule in putting out our Fall 2014 issue. But good news! We hope to have it up on our website within a matter of days. The authors and artists have all been notified and we’re now just waiting on a few contributor bios (well, that and also a few last site maintenance/webpage building type things that we need to finish up). If you’re near Ashland, OR tonight (April 10), be sure to head out to Bloomsbury Books at 290 E. Main, to hear Pepper Trail, Gary Lark, and Cobra Lily‘s own Michael Spring. The evening kicks off around 7pm and is free and open to the public. Full details on Bloomsbury’s website. 1. Another literary magazine? Really? Really. But this one’s different. For example, we do not strive to “publish only the best fiction and poetry.” We find such journals somewhat generic. But we like our region. And the people, places, and plants here (among other things). And so Cobra Lily celebrates this. 2. What do you mean “Southwest Oregon”? Look at a map of Oregon. In the lower left hand corner, you’ll find counties like Curry and Coos, Josephine and Jackson, Douglas and Klamath (sorry they don’t start with the same letter). Sorry, but Lake is South, but perhaps not nearly so West. That said, we appreciate anyone who self-identifies as a Southwest Oregonian. 3. So this is just about a place? Nah. Well, sort of. But we’re seeking that certain missing feeling, that intimate understanding that you simply don’t get in a geographic description. If you know the area, why not consider contributing and helping shape for a new generation of Cobra Lily readers what is meant by “Southwest Oregon.” Otherwise, we encourage you to come back and read new issues as we have them.